Today we’re sitting down with historical romance author Gina Conkle! 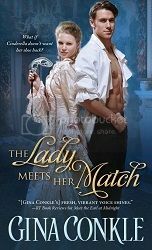 Gina’s latest book, The Lady Meets Her Match, comes out this April. To celebrate we’re participating in the “Ask Gina Spotlight Tour”, take it away Gina! Q. What 3 tips do you have for aspiring authors? 3. Ask yourself if your writing is a hobby or a profession, then act accordingly. Cyrus Ryland didn’t become England’s wealthiest bachelor by being a pushover, but the mysterious beauty he discovers sneaking around his study during a grand ball enflames his curiosity. They share one dance, but when the clock chimes midnight, she’s nowhere to be found. So Cyrus vows to scour all of London to uncover who she is. Cyrus removed his fine blue coat, the slide of cloth on cloth an inviting sound to her benumbed senses. She shuddered when his breath tickled her ear. His warmth and nearness was just as heavenly as what he draped around her. She could tell he found her refusal more amusing than deterring. Cyrus closed the coat in front of her, his body heat palpable inside. The collar’s woven broadcloth brushed her rain-misted cheeks, his pleasant scent on the cloth. The coat was part of an expensive, well-tailored ditto suit: identical blue fabric with spare gold trim on the coat, waistcoat, and breeches. “I’ll ruin part of a perfectly good suit.” But she pulled the coat tighter, greedy for the snug feel. He added more coal to the blaze. The inferno’s orange light danced across white cotton stretched over his shoulders. Muscles moved under the fabric, mesmerizing her while he built a hotter fire. And then there was his offer to waive her rent and give her a loan, an offer apparently free of unique requirements. His act of generosity pinched her conscience. How dare he be so…nice. Ryland glanced at her but said nothing to counter her refusal. Instead, he dropped to the floor, kneeling before her. Without asking her leave, he removed one shoe and then the other, and set the soaked footwear against the hearth’s ash pan. “What are you doing?” Her words, like her body, went slack, all of her too worn down. His head bent close to her knee. One hand, large and warm, curled around her ankle, rubbing life back into her foot. A big, masculine palm moved under the arch, creating delightful friction. She pressed her lips together, holding back a moan of pleasure. Such as covering myself with you. And now, enter to win in this tour wide giveaway! My favorite fairy tale is Beauty & The Beast.